The amount of underwater sound from ship traffic, commercial, research, and military sound sources has increased significantly over the past century. Marine mammals and many other marine animals rely on sound for short- and long-range communication, for orientation, and for locating prey. This reliance has raised concern that elevated sound levels from human sources may interfere with the behavior and physiology of marine animals. The dominant source of human sound in the sea stems from propulsion of ships. Shipping noise centers in the 20- to 200-Hz band. 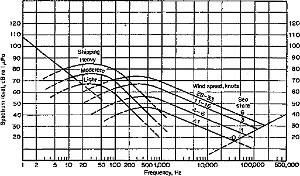 Frequencies this low propagate efficiently in the sea, and shipping has elevated the global deepwater ambient noise 10- to 100-fold in this frequency band. Baleen whales use the same frequency band for some of their communication signals, and concern has been raised that elevated ambient noise may reduce the range over which they can communicate. Marine mammals have a variety of mechanisms to compensate for increased noise, but little is known about the maximum range at which they may need to communicate. Some of the most intense human sources of sound include air guns used for seismic exploration and sonar for military and commercial use. Human sources of sound in the ocean can disturb marine mammals, evoking behavioral responses that can productively be viewed as similar to predation risk, and they can trigger allostatic physiological responses to adapt to the stressor. Marine mammals have been shown to avoid some human sound sources at ranges of kilometers, raising concern about displacement from important habitats. There are few studies to guide predictions of when such changes start to lower the fitness of individuals or have negative consequences for the population. Although acute responses to intense sounds have generated considerable interest, the more significant risk to populations of marine mammals is likely to stem from less visible effects of chronic exposure. Tyack, P. L.. 2008. Implications for marine mammals of large-scale changes in the marine acoustic environment. Journal of Mammalogy 89:549-558.